The Los Arcos bar is a full service bar serving all your local and traditional favorites. From favorite beer selections to a well rounded wine list, the Los Arcos bar is sure to have a drink or two to satisfy your thirst. Need something to fill you up with your drinks? The Los Arcos bar offers sandwiches and finger foods from the bar menu. You have the choice to sit indoors or outside on an inclosed patio. 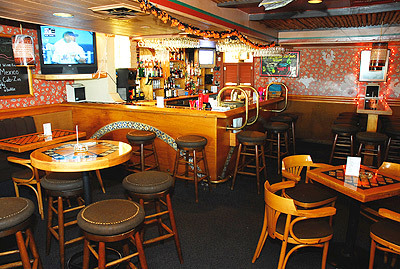 The atmosphere is a comfortable setting to meet and greet friends while relaxing and enjoying your favorite cocktail. Watch sporting events on our large screen TV and enjoy.